The click of a shutter. The white space of a canvas. The elegance of a blueprint. Whatever ignites the spark for you, Concord Academy’s visual arts teachers — all of them artists who love collaborating with students — feel it too. They provide a structured approach to a flexible curriculum that allows students at all levels to thrive. 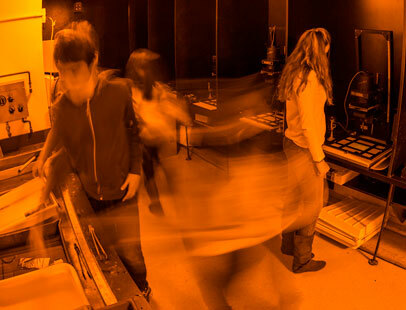 With more than 30 studio art courses, unlimited studio access, and a state-of-the-art media lab, CA’s visual arts facilities invite exploration and inspiration. From foundational courses in drawing and printmaking to intense studio experiences in painting and fashion design, the possibilities for studying visual arts at CA truly are as wide as you can dream. 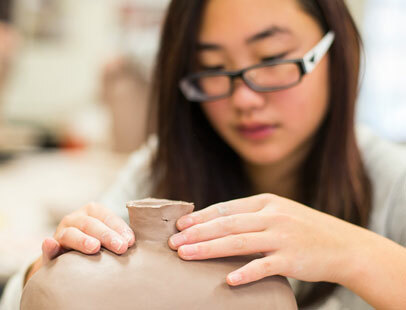 Many students initially explore a broad range of two- and three-dimensional art forms before focusing on, say, documentary filmmaking or wheel-thrown ceramics. In addition to studio instruction, most visual arts courses include lectures or screenings, group discussions, and critiques. First-level courses serve as introductions to a progressively challenging sequence of courses in subjects such as photography, architecture, digital graphic design, fiber arts, sculpture, screenwriting, art history, and film history, to name just a few. Drawing on greater Boston’s rich cultural scene, CA supports the study of visual arts with trips to artists’ studios and in-depth, behind-the-scenes engagement at museums such as the Museum of Fine Arts, the DeCordova Museum and Sculpture Park, and the Addison Gallery of American Art. 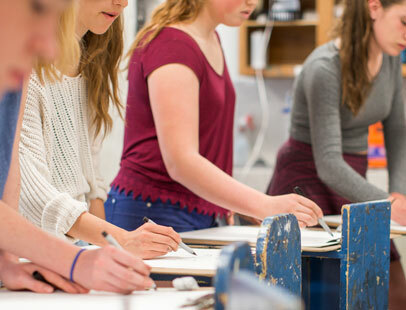 At CA, the arts are embraced as a core component of the student experience, and students bring their creative passions to bear in nearly every class. Parents are welcome to attend the all-community assembly on Wednesday, May 23, at 2:25 p.m. in the P.A.C. to view some of the works made during the spring semester by CA filmmakers. CA’s Fall Semester Student Art Show and Reception took place on Tuesday, January 19. Students, faculty, staff, and guests convened to look at dozens of works on display over three separate floors. The works included brilliantly colored quilts, sculptures, photographs, and paintings. The Visual Arts Department presented its fall film assembly on January 7 to a packed house in the PAC. The films were extraordinarily well received by the Concord Academy community. You can find our full archive of short works on the Concord Academy YouTube channel. CA’s Fall Semester Student Art Show & Reception took place on Tuesday, January 6. Students, faculty, staff, and guests gathered at the Math and Arts Center to observe art work from students in CA's many Visual Arts courses offered in the fall semester. The works included brilliantly colored quilts, sculptures, photographs, and paintings.